Imagine a complex society, maybe tens of thousands of members strong; an unusually long-lived society with extended families of 5 or even 6 generations that live, work, play, and travel together. Now imagine a geological and climatic change that effectively splits that society in two. A huge icy mass fills the only path between the groups. It remains for generations, becoming a permanent fixture that physically separates the two populations. But lives go on. Families continue to grow. Traditions, hunting practices, and languages evolve separately — perhaps diverge. Then one summer day, 10,000 years later, a single member of one of those now-distinct groups is out hunting. 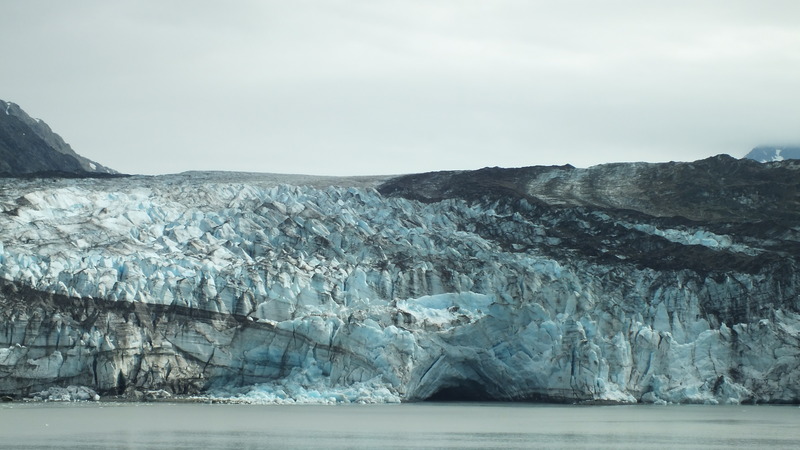 He works the western edge of his hunting grounds – an area normally bounded by the ice barrier – but today he notices it has broken down. There are gaps he can traverse. So he wends his way through the ice and soon finds himself in a whole new domain. There, to his surprise, he finds another of his kind – a member of the tribe that has been separated from his for the last 10 millennia. This is exactly what happened just last month in the northern Canadian Arctic. 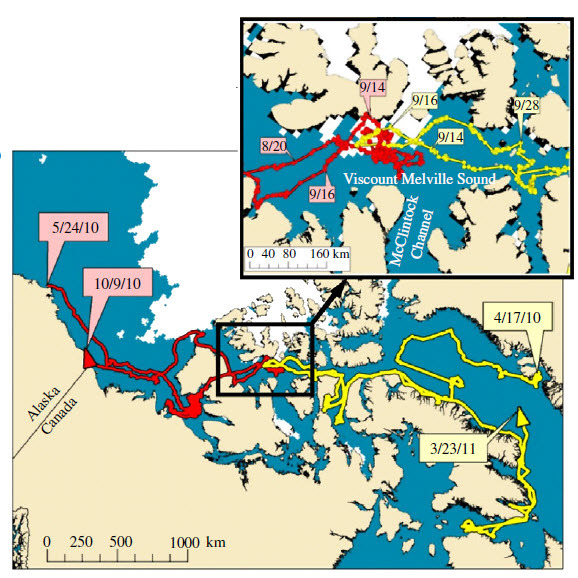 Because of the loss of Arctic sea ice and the opening of the Northwest Passage, two bowhead whales (Balaena mysticetus) , one from the Pacific and one from the Atlantic, suddenly found themselves sharing the waters of Viscount Melville Sound and the Parry Channel in the Canadian Arctic Archipelago for the first time in 10,000 years. This encounter raises all kinds of scientific questions and worries. There is, of course, the overarching concern about climate change and the loss of arctic sea ice. And there are the more local concerns — the spread of disease; the mixing of the ocean waters and other marine organisms; and the increased possibility of detrimental hybridization that has already occurred in some species. But when I read this story, my mind went to the social questions. These are not stupid animals. They are complex creatures with language and behaviors that are passed down through the generations. Being blatantly anthropomorphic for a moment, I want to know what they said to each other. Did they greet each other routinely or was their excitement in their voices? Was it a meeting of friends or strangers? Did they even speak the same language? Do they have Atlantic and Pacific accents? And I want to know if there has been any divergent evolution in these two groups. They are virtually alike genetically, but what about behaviorally? Have they been exposed to different environmental factors that may have caused changes to their behaviour? For instance, do they still have the same hunting and anti-predator strategies? And if not, does one population now have a selective advantage over the other? Alright, I’ll grant that there is probably no major difference between the populations and that the meeting of the two whales is more meaningful to scientists (and to me) than it is to the whales, but I am intrigued by the whole idea that these animals, so long separated, are now reunited and have 10,000 years of catching up to do. Imagine the stories they would tell, if only they could. From their recent memory, they would certainly talk about the 400 Year Slaughter, the period from the 16th to the early 20th century when generations of bowhead families were lost to commercial hunters. The Pacific whale, if he is old enough might even be one of the last 1000 of his kind to have survived those hunts. Given that he is a member of a species that lives upwards of 150 years (possibly more than 200 years), this isn’t a farfetched conjecture. 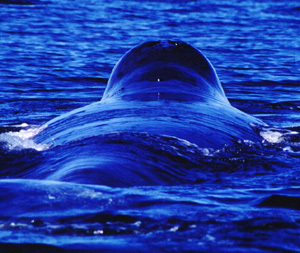 The Atlantic whale would have a similar story – he too a member or a descendant of a remnant population. Before commercial exploitation of bowheads began, it is estimated that 30,000-50,000 of whales existed worldwide, divided roughly equally between Atlantic and Pacific populations. By 1926 when commercial whaling of bowheads was made illegal, there were only 3,000 left. 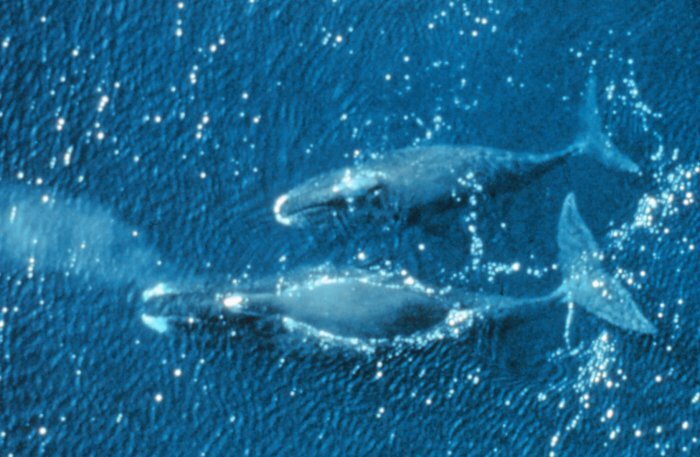 Today, only subsistence whaling is permitted and some bowhead populations are recovering. Current estimates put the global population between 7,000 and 10,000 animals. Whether they talked or not, in September 2010, after nearly two weeks of hunting the same waters, the two traveling bowheads turned and swam back to their normal summer feeding grounds. I’d like to think that when they returned to their families, they each had a story to tell about meeting a lone traveler and distant relative in a newly-opened sea. because of the intelligence level of bowhead whales and their longevity, and their long-term memory potential, it is quite likely that this was quite an occasion for the two whales …. on a different dimension than for us humans observing it from a distance and not privy to their language and their language and level of consciousness and self awareness. one wonders about the long term impact of these two groups coming into contact with each other ….. will there be language sharing, possible culture sharing, genetic intermingling, diseases passed on between groups that one or the other does not have immunity too, and thus may trigger a serious epidemic that might sweep through one or both groups with tragic consequences? all it seems we can do for now is continue watching and marveling at the history of the planet unfolding before our eyes. wouldn’t it be neat to know bowhead whale language. Thank you Kim for stretching our minds. Yes Lori, there have been concerns over disease and immunities. Not to mention, these whales are only the largest representatives of two ocean’s worth of animals, plants, plankton, bacteria, and viruses that may now be mixing. And of course all of this is caused by climate change and the melting of Arctic ice. Canary in the coal mine, indeed.